The two guitarists, along with Richie Kotzen, are currently on tour together. 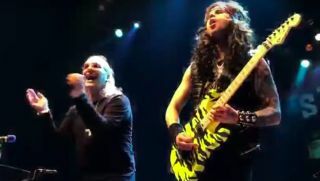 Ozzy Osbourne/Firewind/Solo guitarist Gus G. joins the Jackson family. This time, Guitar World's September cover stars discuss the art of creating quality guitar solos. Of course, they also trade licks! You can check out the video below.